50,000 rounds in just over eight months. And yes, as many of you have guessed, that is Larry “LAV” Vickers himself shooting #50,000. It seemed only fitting that the man most responsible for the HK45’s existence be there at the end of this incredible test. In fact, the HK45 had fewer problems at the 50,000 round mark than either of the previous two 9mm test guns, the S&W M&P9 or HK’s own P30! The HK45 truly is bomb proof, especially when you consider that except for two spring change maintenance cycles, every single part in the gun is original. Most companies recommend changing the recoil springs on their 9mm pistols three or four times more often than Heckler & Koch recommends for the HK45. The HK45 fired its first 31,522 rounds without a bobble of any kind, another pistol-training.com endurance test record. But the mere fact that it out-performed those other pistols tells only part of the story. I do not believe another .45 pistol could fire that many rounds, in that short a time, with that little maintenance, and survive. Anonymous internet chest-thumpers notwithstanding, fifty thousand rounds of full power 230gr ammo through a .45 pistol in eight months is staggering. The HK45 was fired in nine States… and one foreign country, eh? The pistol was only cleaned seven times during the entire test, going 10,181 rounds between cleanings at one point. It’s no secret that I have become the King of All Fanboys when it comes to the LEM trigger mechanism. The version found on the HK45 has a little bit of creep but a very short reset (0.15″ by my measurement, the same as a stock Glock). Muzzle flip is very controllable thanks to the extremely good ergonomics, the texture of the so-called “spiderman grip,” and the buffered recoil spring assembly. That’s meaningless. Some guns are simply more mechanically accurate than others, and regardless of how accurate a particular shooter may be, the gun is going to add a certain margin of error based on that mechanical accuracy. So while I wouldn’t say handgun accuracy is the most important factor in the world, the fact remains that an accurate pistol will deliver better results — especially on low probability shots — than an inaccurate one. So how accurate is the HK45? My sample turned in unwavering results from beginning to end. When new, with the stock sights (which are borderline useless), I got an average of 2.22″ groups with Winchester 230gr Ranger SXT. After changing sights, that dropped to 1.80″. After fifty thousand rounds, not to mention thousands of rounds since its last cleaning, did the HK45’s accuracy falter? Not at all. Pictured at left is the 1.39″ group I got shooting that ASYM 185gr ammo (five 5-shot groups averaged 1.85″). Reliability: There’s almost no way the HK45 could have proven more reliable. Only twice in 50,000 rounds did the gun fail to go through its entire cycle of operation, ready to fire again with nothing more than a trigger pull. Once was a light primer hit, the other was a broken trigger return spring. That’s a Mean Rounds Between Stoppage of 25,000 rounds… ten times the industry standard. What is perhaps even more amazing is that it achieved that reliability getting cleaned on average less than once every 7,000 rounds. The industry standard for cleaning during endurance reliability testing is once every 250 rounds. So the HK45 went twenty eight times as long without cleaning and still achieved ten times the industry standard for reliability. The only other incident the gun suffered, as described in great detail here, was a dislodged sear spring. With the spring no longer in place, the gun continued to fire but was stuck in true “double action only” mode with a substantially heavier trigger pull. Durability: As mentioned above, the pistol had a trigger return spring break during Week Twenty Five, just shy of thirty five hundred rounds into the spring’s service life. It was just a random thing, and proof that no matter who you are and what you’re doing, sometimes springs break. Keep in mind that except for some springs that were changed at 12,500 round intervals give or take, there were absolutely no parts replacements done during this entire test. Hammer, sear, trigger bar are all original. Extractor is original. Hammer strut is original. Even the pins are original. Nothing broke. Nothing even looks worn out. And what about the magazines? Almost all 50,000 rounds were fired through the same six practice magazines during the entire test. The mags were dropped on concrete, stepped on in the sand, drowned in muddy water… and never once cleaned or even disassembled. Not a single spring or follower was replaced. They still work 100%. Contrary to internet myth, the zipper welds on the backs of the magazines are also still perfectly fine. And that’s just as true on my carry mags, which remained loaded twenty four hours a day, every day, during the entire test. That big, over-engineered HK45 is as tough as a handgun could possibly be. Concealment & comfort: Let’s face it, though, that big, over-engineered HK45 is, well, BIG. This is not a gun that was designed for concealed carry. It’s a battlefield weapon, much more at home in a soldier’s drop leg or a police officer’s duty rig than a thin IWB concealed carry holster. Nonetheless, carry it concealed I did… and in an appendix IWB, to boot. But holster selection was extremely critical, with the Garrity In-Victus the only holster I could comfortably wear for hours while driving. Even then, the HK45 did not have the same invisible “feels like I’m not wearing anything at all” quality that the P30 does in either an In-Victus or a Custom Carry Concepts Shaggy. The magazines are also bulky, and my spare magazine was often more noticeable underneath my shirt than the pistol itself. One complaint some folks report with the HK45 is that between the trough in the trigger guard and the large pointy magazine release paddles, they get “stung” when pulling the trigger. This was never a problem for me, but in fairness after almost 100,000 rounds of P30 shooting last year, I might have built up a tolerance! So while the HK45 is a pistol you can carry concealed if you’re willing to make the effort, that is clearly not what it was designed for and not what it does best. Clean up the trigger a bit. Less creep, less overtravel. Noted polymersmith David Bowie does an outstanding piece of work called, conveniently, the “Vickers HK45 mods” which include an internal overtravel stop. I did not have this done to the test gun, but if the overtravel bothers you (or some of the other mods are to your liking), it’s a no brainer option. Compact floorplates. The current floorplates were designed to pass some grueling NATO durability tests. They’re the size of a Volkswagen and not quite as ergonomic. The longer a flootplate’s lip extends past the magazine body, the harder it is to reload well. A more flush-fitting 9rd magazine might not be a bad idea, either. Usable sights. Flat out, the stock sights are among the worst in the industry. They’re huge, the front sight is wide, the rear notch is narrow, and the “charge to glow” dots are distracting at best (and invisible in the dark unless your prognostication powers allow you to charge them up before trouble starts). Modular side panels. As well as the HK45 fit in my hand, it was nothing compared to the fully customizable P30. The HK45 would definitely benefit from the replaceable side grip panels found in its 9mm cousin. Easier assembly. This is a holdover from last year’s P30 experience. The HKs are incredible guns, but if you’re going to detail strip one it helps to have a PhD in Mechanical Engineering. Certain components could be modified into multi-part assemblies that would be more easily dropped into the gun. For example, the two pieces of the LEM hammer and the elbow spring could easily be turned into a single “part” that didn’t rely on gravity and the Force to align properly for assembly. Nitpicks aside, though, it’s hard to argue with the HK45 as a serious .45 fighting gun. You would be hard pressed to find any gun, in any caliber, capable of delivering the dependability, durability, and shootability of the HK45. This is truly a gun that will withstand far more abuse than its owner could possibly hope to survive, and turn in far greater speed and accuracy than most shooters could ever hope to achieve. HK USA president Wayne Weber, Angela Harrel in public relations, and HK gunsmith extraordinaire Sam Bass (Mgr, HK Repair). HK provided more than just a gun and some ammo for this test. They provided constant access and answers from start to finish without ever trying to influence any aspect of the process. Melissa Garrett at ATK CCI-Speer/Federal for another year of making impossible to find ammunition appear magically at my doorstep in time for testing. Mark Garrity of Garrity’s Gunleather for the In-Victus appendix inside-the-waistband holster that was used almost every day of the test. Rich Schaefer of Custom Carry Concepts for the Shaggy aiwb holster that I also used from time to time, and the BMC Basic Mag Carriers that were part of my everyday kit whether I was teaching or just doing the CCW thing. Rich also modified some of my HK45 floorplates to make them far more functional in terms of both reload speed and concealability. The great folks at Heinie Speciality Products for the Slant Pro QWIK Straight Eight night sights that replaced the (nearly useless) stock HK45 sights. The staff and management at the NRA Headquarters Range in Fairfax, Virginia for their non-stop support as well as their constant vigilance in providing a safe environment in which to shoot for hours on end, week after week. Larry Vickers and Ken Hackathorn for taking the time to sit through two hours of questions about their experience with the HK for the upcoming capstone on the HK45 test. Congrats, Todd. I hope for your index finger’s sake that your next test gun is a 9 Mike Mike. Very well done!! I would have NEVER considered buying a HK 45 till this test, now I cant wait to get one!!! I do kinda hope your next test gun is a 4th gen Glock though..
Any other endurance tests in the works at this time? Well done, Todd. Any chance for the Warren Tactical sights for HK45/P30 to become available? LEM and better sights are two things I’d like to change on my HK45. re: 2011’s test, we’ll have more to say about that in the new year, possibly right after SHOT. For now, I am extremely happy to be carrying my P30. re: Warren sights for the HK45/P30, still no response from Warren regarding the issue we ran into installing the prototypes on the HK45. For now, the Heinies are definitely the way to go. Congrats Todd for another milestone. I shot an HK45 a little over a year ago and completely agree on the sights and size, other than that it is a fine pistol. Ok, to sumise, do you like the stock sights and what is the next gun going to be? I don’t think we’ve heard enough about either of those two things yet. It was nice that you could bring the HK to Canada for the course, whatever your next gun is, make sure you get 10 round mags for it so you can come back up here with it. Thanks for another informative endurance test Todd. Your P30 test convinced me to buy one, which I now put 1000 rounds through every month. It has had one malfunction in 5000 rounds so far. I’ll definitely be picking up an HK45 if I ever decide to move up to “big boy” caliber! I submit. I’m getting an LEM conversion done, I’ve finally had it with the V3 reset! Oh. The way you were describing it, I thought it was shorter. Awesome test yet again! Are you going to take a break to try and recover from the beating you took this time? Just an FYI, you can get similar work as Grayguns from Apex Tactical Specialties as well on the USP, P30 and HK45. I really enjoyed this test. I look forward to reading about the next pistol. I think a lot of people convince themselves X pistol is “the” pistol but this test is evidence the HK45’s performance and reliability places it among the best! Thanks. Well done, Sir! An excellent test and documentation of the entire process made for great reading and better knowledge of its abilities. A definite high water mark for how a pistol should be tested. Very much to your credit, I’ll say this: Despite my utter lack of interest in HK45 pistols, this was a fascinating and extremely well done review. It’s always a joy to read truly professional-quality write-ups on gun topics, even if the specifics aren’t something I have any real interest in. Since I started reading your several articles I’ve learned a lot. As soon as I receive my HK P30, I’ll try to put all that knowledge in practice. I promise you a glock 17 or glock 19 will not make 50,000 rounds without replaceing any springs man. Glocks springs go way quicker than HK’s do. Nice test Todd, Ill be picking up my HK45 here soon, I got the compact right now, deciding on either an HK45 or P30 now, but I am leaning towards the HK45. I’ll second (or third or fourth) the request for a test of the Gen4 Glock 9mm, preferably the 19. Charles — It was born in the USA. Any claims that German-made HK45’s are “better” than American-made ones clearly come from folks who don’t know what they’re talking about. HK-Germany played a very serious role in making sure that the US-made guns would be built to the same standards of quality as the ones from Oberndorf. Alex — Just to be clear, neither the P30 nor HK45 went 50,000 rounds with a spring replacement, either. The P30 had a full spring replacement every 25,000 rounds (and 12,500 rounds for the trigger spring after one broke); the HK45 had a full spring replacement cycle twice during the 50,000 round test. Wow that was an awesome test! In your opinion would the USP45 or HK45C turn in a similar performance durability, reliability, accuracy wise? Shouldn’t make promises you can’t keep. That simply isn’t true. Todd—-just like another poster, I also have no interest in HKs—and yet your series was informative and interesting. Keep it up! Hit up FN for a 5.7, you need a break from recoil. Chuck — Only if my personal threat profile starts to include rabid prairie dogs. dj — There’s really no way to say definitively that another gun would do what this HK45 did. Given design similarities and the use of identical materials and QC processes, I’d say the HK45C would be the most likely contender. -I was simply explaining to him that this was highly unlikely. All that aside, again Todd, great tests, love what you are doing man, really appreciate the info. Keep it up! While I think it’s good to know exactly how reliable the HK45 and the S&W M&P are, the tests didn’t really change my perception of what gun I should buy, since I already thought these guns were good choices considering the number of government agencies that use them. Now that we have a baseline, I would be more interested in seeing endurance tests of guns that aren’t used by agencies that do their own testing. Since the NYPD stopped approving the Kahr PM9 as a BUG, should consumers avoid it? I would also be interested in tests of more affordable guns such as the Ruger SR40 or the S&W SD40. Also, don’t forget that springs for glocks are very cheap to buy and can be had from just about any decent local gunsmith. They can be installed by yourself while standing at the counter after you bought them or you can do it yourself in your car in about 3 minutes if you’re slow. The HK appears to require a bit more skill and patience to work on from the reports I’ve read on here. Just kidding Todd, I’m not a 5.7 fan boy at all. Would be an easy test though. Ed, the HK is a freakin Chinese jigsaw puzzle compared to most other service pistols I have detailed out, especially when compared to the Glocks and M&Ps. The HK is far worse to work on that even some more traditional guns that have more parts, like the 3rd gen S&Ws. I told you that thing was a beast. LOVED the torture tests! Learned a lot from the other posts, as well. I’ll continue reading no matter what the next gun is. THANKS, TODD! A BUG/pocket gun would be a VERY interesting torture test. (LCR? LCP? S&W Bodyguard?) Or even a comparison torture test for several BUGS. I’ve seen quite a few people purchase them, then can’t get through 30rnds w/o a malfunction. Which leads to the question: which BUG/pocket gun is the most reliable?? Sub-compact version of large guns, or dedicated little guns? THAT I would pay to read! I’m looking forward to hearing what’s next for PT.com! 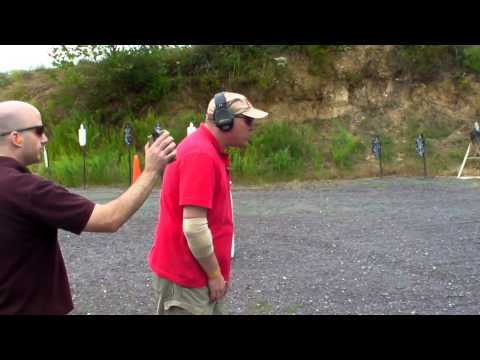 Great test I had the other HK a USP fullsize 45… It never had an issue.. I found it a bit large to conceal well… I like the USP Compact… I wonder if it would have similar results? My other HK is a P7 it’s been flawless too.
? on H&K 45. On the LEM trigger fix at the factory, your running the 4.5 lb kit and the gun still has gone to Bowie concepts-correct?